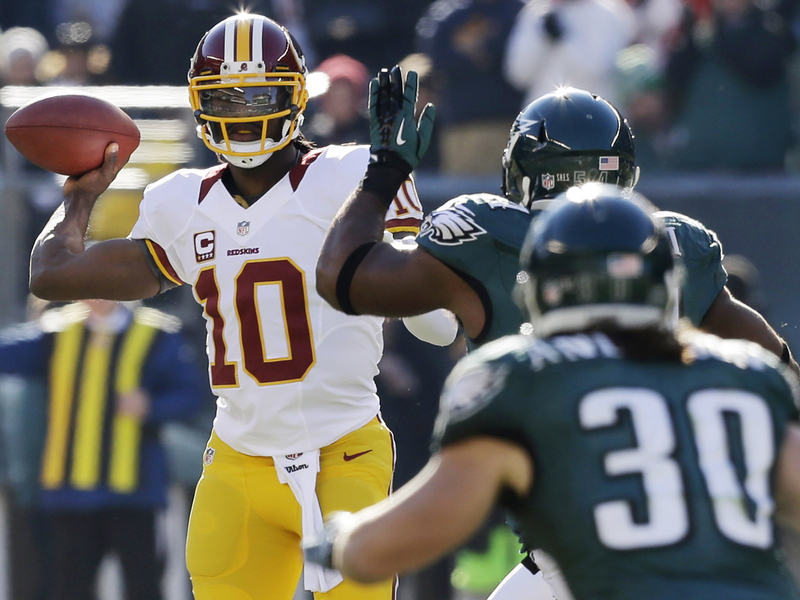 PHILADELPHIA -- Counted out by their own coach six weeks ago, the Washington Redskins and Robert Griffin III are on the brink of their first division title in 13 years. Griffin threw a pair of touchdown passes in his first game back from a knee injury, Kai Forbath set the NFL record for consecutive field goals to begin a career, and the Redskins held on to beat the Philadelphia Eagles 27-20 on Sunday for their sixth straight win. Nick Foles drove the Eagles to the Washington 5 before his intentional grounding penalty ended the game. The Redskins (9-6) can clinch the NFC East with a victory over Dallas at home next Sunday. They haven't won it since 1999 and last reached the playoffs in 2007. Trying to play spoiler, the Eagles (4-11) fell short in what could've been Andy Reid's last game coaching the team at home. Reid is unlikely to return to Philadelphia for his 15th season next year. ARLINGTON, Texas -- Garrett Hartley kicked a 20-yard field goal in overtime, and New Orleans damaged Dallas' playoff hopes. Drew Brees threw for 446 yards and three touchdowns and led a drive to the winning kick. The Saints lucked out before the winning kick when a fumble by Marques Colston rolled forward about 20 yards to the Dallas 2. Jimmy Graham recovered. The Cowboys lost despite rallying for two touchdowns in the final 3:35 of regulation. Tony Romo, who threw for 416 yards and four scores, hit Miles Austin for the tying touchdown with 15 seconds left in regulation. The playoff hopes for the Saints (7-8) ended with Minnesota's win against Houston. The Cowboys (8-7) lost control of their playoff fate. KANSAS CITY, Mo. -- Andrew Luck threw for 205 yards to break the single-season rookie record, and his touchdown pass to Reggie Wayne late in the fourth quarter put Indianapolis in the playoffs. Luck surpassed Cam Newton's year-old record of 4,051 yards passing by a rookie in the second quarter, and then came through in the closing minutes. He marched Indy to the Chiefs 7, then found Wayne in the back of the end zone on third-and-goal for the go-ahead score. It was the seventh time Luck has rallied his team to victory in the fourth quarter. Darius Butler returned an interception 32 yards for a TD in helping the Colts (10-5) join the 2008 Miami Dolphins as the only NFL teams to win at least 10 games after losing 14 or more the previous season. The Chiefs are 2-13. PITTSBURGH -- Josh Brown kicked a 43-yard field goal with 4 seconds remaining to put Cincinnati in the playoffs and eliminate Pittsburgh from postseason contention. Brown missed a 56-yarder earlier in the quarter, but earned a second chance when Reggie Nelson picked off Ben Roethlisberger and returned it to the Pittsburgh 46 with 14 seconds remaining. Andy Dalton hit A.J. Green for 21 yards on the next play, setting up Brown's game-winner to put the Bengals in the playoffs for consecutive years for the first times since 1981-82. Dalton completed 24 of 41 for 278 yards and two interceptions for the Bengals (9-6), who snapped a five-game losing streak to Pittsburgh (7-8). HOUSTON -- Adrian Peterson rushed for 86 yards, falling far short of the 2,000-yard mark, yet helping Minnesota keep its playoff hopes alive. Christian Ponder threw a touchdown pass, Toby Gerhart added a score and Blair Walsh kicked three field goals. The loss kept the Texans (12-3) from clinching home-field advantage throughout the AFC playoffs. Peterson had his lowest rushing total since getting 79 yards on Oct. 14 in a loss at Washington. He has 1,898 this season and needs 208 yards to break the NFL single-season rushing record held by Eric Dickerson. The Texans failed to score a touchdown for the first time since 2006. BALTIMORE -- Joe Flacco threw for 309 yards and two touchdowns as Baltimore won the AFC North. The Ravens (10-5) led 24-7 at halftime and cruised to the finish behind a short-handed defense that harassed quarterback Eli Manning and limited New York (8-7) to 186 yards. Baltimore scored touchdowns on its first two possessions and amassed a season-high 533 yards - including 289 in the first half alone. The victory ended a three-game skid for the Ravens and assured them of a home playoff game in the first weekend of January. The defending Super Bowl champion Giants (8-7) can't win the NFC East, but still have a chance to make the playoffs as a wild card. DENVER -- Denver won its 10th straight game as Peyton Manning threw three touchdown passes for the 72nd time of his career. Denver (12-3) pulled into a tie for first place in the AFC with Houston, which fell 23-6 to the Vikings. Manning finished with 339 yards on 30-for-43 passing. Von Miller was in on two sacks for the Broncos, the second of which knocked Browns quarterback Brandon Weeden out of the game with a right shoulder injury. If Denver defeats Kansas City at home next week and Houston loses at Indianapolis, the Broncos would be the AFC's top seed. SEATTLE -- Russell Wilson threw four touchdown passes to move into second place for TD passes by a rookie, Marshawn Lynch scored twice, and led by their rocking crowd Seattle clinched a spot in the NFC playoffs with a rout of San Francisco. Wilson threw TDs to Lynch, Anthony McCoy and two in the second half to Doug Baldwin to give him 25 for the season, one shy of Peyton Manning's record of 26. Lynch added 111 yards rushing and a 24-yard TD run on Seattle's opening drive that set the tone. Richard Sherman returned a blocked field goal 90 yards for a touchdown and added an interception for the Seahawks (10-5). Colin Kaepernick and the 49ers (10-4-1) struggled with the deafening noise echoing around CenturyLink Field, making for a miserable 49th birthday for 49ers coach Jim Harbaugh. GLENDALE, Ariz. -- Chicago's defense scored two touchdowns to keep the Bears' playoff hopes alive. Charles Tillman returned an interception 10 yards for a score, the third pick he's brought back for a touchdown this season and the eighth overall by Chicago, one shy of the NFL record. Zack Bowman returned a fumble 1 yard for another Bears score. Brandon Marshall caught six passes for 68 yards and a TD, breaking the Bears franchise record for yards receiving in a season in the process. GREEN BAY, Wis. -- Aaron Rodgers threw for three touchdowns and ran for another, Ryan Grant scored twice and Randall Cobb set a single-season franchise record for net yardage. The victory ensured the Packers (11-4) will at least be the NFC's No. 3 seed. They still have a shot at the No. 2 - and the first-round bye that goes with it - if Seattle beats San Francisco on Sunday night. It was the first time the Packers have scored more than 50 points since 2005. Jake Locker was sacked seven times and picked off twice, and Tennessee (5-10) scored with 1:39 left to avoid the shutout. JACKSONVILLE, Fla. -- Tom Brady overcame a rough start by throwing two touchdown passes for playoff-bound New England. Brady threw two interceptions in the first quarter, the second helping the Jaguars (2-13) build a 10-0 lead. But the Jaguars faded in the third quarter for the fourth consecutive week, lost for the 11th time in the last 12 games and set a franchise record for losses in a season. Brady hooked up with Wes Welker for a 2-yard score on the second play of the fourth quarter, putting the Patriots (11-4) ahead 23-13. EAST RUTHERFORD, N.J. -- San Diego sacked Greg McElroy 11 times, ruining the quarterback's first NFL start, and Philip Rivers threw two touchdown passes for the Chargers. McElroy, the third-stringer who was starting for the benched Mark Sanchez, moved the offense for the Jets (6-9) early but faced pressure all game. With a chance to get New York back into it with less than 5 minutes remaining, McElroy was sacked by Shaun Phillips and lost the ball. Phillips recovered and San Diego (6-9) sealed the win. Rivers had touchdown tosses of 37 yards to Danario Alexander and 34 yards to Antonio Gates. CHARLOTTE, N.C. -- Cam Newton threw for 171 yards and a touchdown and ran for 60 yards and another score as Carolina won for the fourth time in its last five games. The Panthers (6-9) held the Raiders to 189 total yards and 12 first downs in a game featuring several shoving matches, plenty of heated exchanges and six unnecessary roughness penalties - including one that sidelined Oakland quarterback Carson Palmer for the day. Even Newton drew a flag after bumping an official with his chest for what he perceived as the latest in a series of late hits by Raiders defenders. He was not ejected. The Panthers built a 14-3 lead at halftime. Newton accounted for 231 of the 271 yards. TAMPA, Fla. -- Sam Bradford tossed a pair of touchdown passes and rookie cornerback Janoris Jenkins scored his fourth TD of the season. Bradford connected with Lance Kendricks on an 80-yard scoring play on the first play of the third quarter. The Rams (7-7-1) intercepted Josh Freeman four times, turning three of the turnovers into TDs, including Jenkins' pick and 41-yard return early in the second quarter. Steven Jackson rushed for 81 yards and one TD, moving within 10 yards of reaching 1,000 for the eighth consecutive season for the Rams. Tampa Bay fell to 6-9 after its fifth straight loss. MIAMI -- Reggie Bush caught two touchdown passes and scored on a short run for Miami. Six minutes after they won, the Dolphins (7-8) were eliminated from playoff contention when Cincinnati beat Pittsburgh. The Bills (5-10) came into the game assured of missing the playoffs for the 13th consecutive year. Bush's first TD catches of the season covered 17 and 12 yards.